Weight: 7 - 8 kgs. Capacity: 50 Kg/hr. to 500 Kg/hr. Capacity: As per customer requirement. We manufacture good quality dry ice making machines which are very easy to use & require very less maintenance. 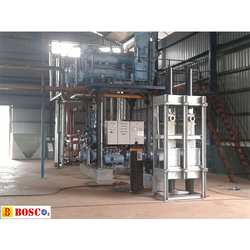 These dry ice making machines are widely used & are highly accepted. - These diets are a step up from Purified Diets in that pure Amino Acids are used as the protein source. This section provides general information on the L-Amino Acid Defined Diets we produce. It does not give a complete listing of the various modifications available. A small , compact, automatic machine for producing solidified cardondioxide cakeshaving in built regulator. It is useful for small batch techiniques of freezedrying microtomy, distillation etc. Hand Operated, it works on joule thomson system. 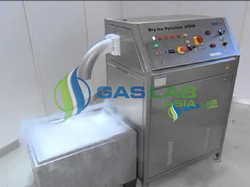 Our company has been involved in offering Dry Ice Machine to the clients. D & T Traders Pvt. Ltd. Description:The ASCO Dry Ice Pelletizer P700 is a compact very-high-capacity pelletizer for the production of densely compressed dry ice pellets. It has a production capacity of 700 kg/hr (1543.24 lbs/hr) and produces dry ice pellets with a diameter of 3, 6, 10, 16 and 19 mm (1/8, 1/4, 3/8, 5/8, 3/4 in). Dry Ice Machine that produces Dry ice blocks of varied sizes and Capacities.